Click a region on the map to learn more. Charlotte’s tremendous growth rate is reflected in the housing market, which has remained hot for years, no matter the swing in interest rates. The city offers an array of homes, both existing and new construction, giving people a selection large enough to accommodate anyone’s taste. And you’ll find just about any style you want: cozy bungalows or two-story Georgians, modest ranch houses or custom-built mansions, ginger-breaded Victorians or contemporary condos. The same variety abounds in lifestyle. Choose from Uptown living or suburban locations, comfortable old towns or new-home communities, urban homesteading or prime Piedmont countryside. Some current trends in the Charlotte region’s housing market may add an interesting twist or a challenging dimension to your search. First, while prices are still reasonable here compared to some other parts of the country, housing in this area isn’t the bargain it once was. Thus, depending on your circumstances, finding a home in your price range may mean you’ll have to look a bit longer, come up with some more cash or expand your search to less-costly neighborhoods that are a little farther away from the office. At the same time, you’ll find some options here that you wouldn’t have enjoyed a few years ago. Case in point: condos and lofts in various locations throughout Uptown and other urban neighborhoods in Charlotte. Neo-traditional communities, whose homes and layout reflect the old-fashioned neighborhoods many of us grew up with, also have become extremely popular. If you like condos or townhomes, you’ve come to a good place. The condo market has boomed in the past decade, with sales nearly doubling in the five-county Charlotte region. In addition, building permits for condos and townhomes have increased several hundred percent over the last five years. With demand, though, comes a higher price. You’ll pay more for a condo in Charlotte’s hottest neighborhoods, although you may still find some bargains in new construction and former apartments that were converted to condos years ago. One way to start your search is with the area map prepared by the Charlotte Regional Realtors Association and the Carolina Multiple Listing Service, which covers seven counties including Mecklenburg. The map, which pinpoints neighborhoods and developments in the Charlotte region, is used to organize home listings in the MLS directory and newspaper classified ads. You also can look for current listings on the CRRA/MLS Web site, www.carolinahome.com. The center of the map is Uptown, which has a rapidly growing list of residential options. Look for Uptown listings in Area 99. Nine areas branch out from the center in a clockwise fashion, starting at the top, or the north. Area 1 is north, Area 2 is northeast, Area 3 is east, Area 4 is southeast, Area 5 is south, Area 6 is south-southwest, Area 7 is southwest, Area 8 is west and Area 9 is northwest. Because the metro region has sprawled across county lines, the area designations extend there too. They include Area 10, Union County; Area 11, Cabarrus County; Area 12, Iredell County; Area 13, Lake Norman; Area 14, Lincoln County; Area 15, Lake Wylie; Area 16, Gaston County; Area 17, York County; Area 20, Alexander County; Area 21 Rowan County; Area 22, Cleveland County; Area 23, Stanly County; Area 24, Lancaster County; Area 25, Anson County; Area 29, Catawba County; Area 35, Chester County; and Area 42, Mountain Island Lake. 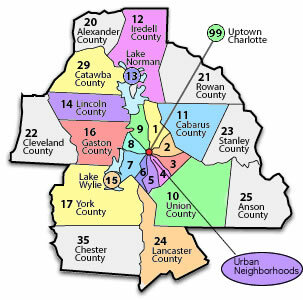 You can search Charlotte MLS listings for homes in these areas here. For its real estate stories, First Impressions has grouped neighborhoods that share similar interests and lifestyles, such as south Charlotte, University City and urban neighborhoods. Consequently, the stories don’t follow the MLS area boundaries. Once you’re ready to buy, choose from the wide selection of mortgage options. The area is served by dozens of firms, including mortgage brokers who represent lenders nationwide as well as local lenders. You can find plenty of options for 30-year and 15-year fixed mortgages, ARMs (adjustable rate mortgages) with a variety of terms and jumbo loans. To help you negotiate the mortgage challenge, here are two tips. First, before you shop, qualify for a loan to know how much financing you can seek. Second, take a few minutes to make sure your paperwork is in order. Check your credit reports and clear up any nasty surprises you might uncover. Organize your financial papers so you’ll have the documentation you need at your fingertips to complete the application process quickly. For more information on what the Charlotte area has to offer, check with your real estate agent. Realtor advertisements appear throughout this magazine. You’ll find these agents know the area well and can guide you in the right direction. This region is a collection of towns and neighborhoods, each with its own unique personality and home styles. So grab a map and spend some time driving through neighborhoods and subdivisions in and around Charlotte. Your new home is out there – just waiting to be discovered.